Red and white striped with yellow anthers. medium to large 4" x 2"
The plant habit is upright and open. The bloom consists of 33 petals and 19 petaloids. The plant is a profuse bloomer. 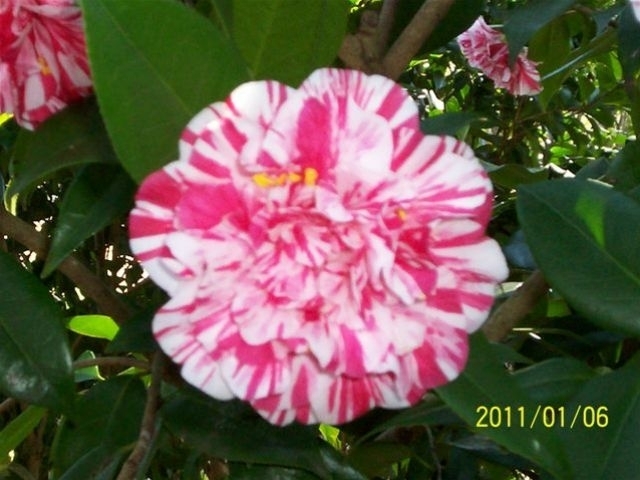 The flowers fall in one piece, are long lasting and are consistent in form. The dark green leaves average 3 3/4" x 1 3/4". The plant is suitable for landscaping and exhibition uses. Originated, registered and propagated by N. C. Barnard of St. Elmo, Alabama.